According to Wikipedia, a palindrome is a word, phrase, number, or other sequence of units that can be read the same way in either direction (the adjustment of punctuation and spaces between words is generally permitted). 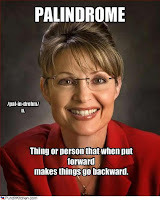 So if you're an American, today is a palindromic date - 01/02/2010 is the same read forward or backward. But in Europe, they do the day, then the month, so today is not palindromic - 02/01/2010. If we just use 2 digits for the year, we'll have another on 01/11/10 - but that's too easy. Palindromic dates do not occur regularly. We've already had one in this century - 10/02/2001 - and we'll have another on 11/02/2011. But before this century, the last one was 600 years ago on 08/31/1380. Most people are more familiar with palindromic character by character words - civic, radar, level, rotator, kayak, racecar, mom. There are also palindromic phrases - "A Man A Plan A Canal Panama", "Able was I ere I saw Elba", "Was it a rat I saw? ", "Dammit I'm Mad". Some palindromes use words as units rather than letters - "Fall leaves after leaves fall", "First Ladies rule the State and state the rule: ladies first", "Girl, bathing on Bikini, eyeing boy, sees boy eyeing bikini on bathing girl". The command "Level, madam, level!" ,composed only of words that are themselves palindromes, is both a character by character and a word by word palindrome. There are palindromes in poetry, music, biology, acoustics, and computer science. Semordnilap (palindromes spelled backward) is a word or phrase that spells another word or phrase backwards - stressed/desserts, saw/was, dog/god. Of course, this day could not go by without someone applying this to Sarah Palin. Bush and Palin together never said anything this freakin stupid. Maybe if you would stop being the typical hateful liberal by constantly calling names you might actually enjoy life more. Again, liberals hate more than conservatives. Polls actually prove that. How does it go..."do unto others...bla bla bla..."
Mississippi Woman Makes the Big Time!